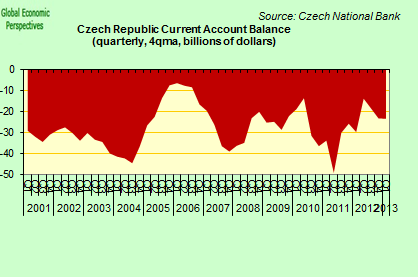 Curiously both these events serve to highlight one important underlying reality – Czech voters are deeply dissatisfied and in a highly skeptical mood, since following seven quarters without growth the country’s economy is evidently stuck in the doldrums. The worst part is things look highly unlikely to improve anytime soon. As I think everyone agrees, flood damage is a form of wealth destruction. If you have a house on one day, and the next you don’t then somehow you feel poorer. It isn’t really surprising that you feel poorer because in actual fact you are poorer. Naturally, if your home gets rebuilt, and you find yourself with an even better one as a result, then you may even feel you have benefited (although what about all those valued personal belongings you lost), but that will be because someone else, either a government or an insurance company, has made good your loss, so they are poorer instead of you. As Reuter’s reporter Michael Winfrey puts it: “Governments and insurers from Germany to Romania will have to pick up the costs of helping families and business recover from the floods, which have killed at least a dozen people and driven hundreds of thousands from their homes since the start of June“. But will the extra demand really generate extra growth in the longer run, rather than simply advancing spending from the future to now (or as the Spanish expression so evocatively puts it “give us bread for today and hunger for tomorrow”) ? The evidence we have seems to suggest that it will if the problem the economy was suffering from was a lack of stimulus – which brings us nicely round in a circle to the stimulus versus austerity debate. But if lack of stimulus wasn’t the problem, as we have seen in the Japan case, an extra reconstruction programme won’t make a blind bit of difference at the end of the day. It will simply shift demand around a bit in time. The Baltics, Hungary, Romania and Bulgaria are all recognized – each in their own way – to have encountered serious economic problems and generated sizable imbalances during the run in to the global financial crisis. These problems – at the time – were seen as placing serious question marks over the underlying soundness of a group of economies which in the pre-2008 world were often lauded for their growth prowess and fiscal abstemience when compared with their West European neighbors. The fact that these countries started, one after another, to go off the rails could be explained by viewing them as examples of the “weaker economic cases”in the group. But when, in a way which curiously parallels what is now happening in purportedly “core Europe” countries like Finland and the Netherlands in the West, what were previously regarded as best-case-scenarios, like the Czech Republic and Slovenia, start to struggle and then continue to flounder, well perhaps we should be raising more than an eyebrow or two – indeed, maybe we should really be asking ourselves some serious, thought-provoking questions not only about the structural depth of the problems being faced by the whole group of Eastern Accession countries, but also even about the very soundness and adequacy of the received theories the main multilateral policy institutions are working with. In the current case, the Czech Republic is now in all probability in its eighth quarter of recession – and the last time the economy actually grew was in the three months up to June 2011. This is quite a preoccupying outcome for a country which was not perceived to be suffering from any special problems – like outsize credit booms, or government fiscal largesse – in the pre-crisis world. The economy is now moving sideways, and, more importantly, substantial question marks hover over what the country’s real future growth potential actually is. Certainly, and in any event, it is well below that which was considered a norm pre 2008. In the past the country was characterised by and renowned for the soundness of its industrial base and its strong export performance, but the continuing crisis in the Euro Area (the principal source of external demand for the country’s products) has meant overseas sales have been largely stagnant for some quarters now. And with countries in Southern Europe striving to make a substantial competitiveness correction and claw back some of their lost ground, it is in the East of Europe where the impact of these efforts is likely to be most acutely felt. It was precisely during the time that the Southern economies were shifting over to credit-driven service ones that their Eastern counterparts were busy building their industrial foothold in the EU. Now those in the East face the risk that a sizeable chunk of this coupling and integration process may simply unwind. A rising tide may lift all boats, but what does a flat sea do? 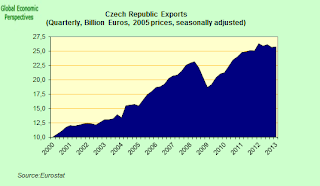 Czech industrial activity has become virtually stagnant when it isn’t actually falling. Naturally, both the IMF and EU Commission assume that what is happening to the country does not go far beyond a short term blip, and both institutions take it as a given that “recovery” will set in somtime soon. As the IMF puts it, “The Czech Republic’s economic fundamentals are strong.” The EU Commission broadly agrees: “Due to a strong downturn in consumer confidence, a drop in public investment and a weaker external environment, real GDP is estimated to have decreased by 1.3% in 2012. As these factors ease off in 2013, economic activity is forecast to bottom out in the middle of the year. 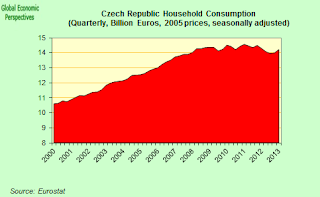 The recovery is expected to consolidate in 2014, supported by growth of real household income“. That being said a nuanced but interesting divergence has emerged between the two Troika partners over the immediate outlook for the country. While EU Commission see “domestic risks to the outlook” as “fairly balanced“, the IMF feels general risks lie “mainly to the downside” highlighting the risks of “further deterioration of euro area growth” and the danger of “permanent scars to potential growth“. The Fund explain their concerns as follows: “With recent disappointing export performance, the economy is at the risk of being dragged deeper into recession. Also, the current poor growth performance, if protracted, runs the risk of translating itself into a long-term decline in potential growth due to lower investment.” I.E. the slowdown could eventually become self perpetuating if the recession becomes an even more dragged out affair. Unfortunately this possibility is far from being excluded. 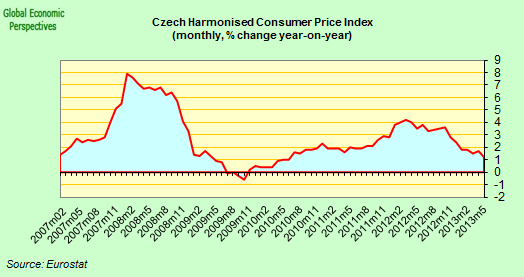 Given the existence of such risks it is worth asking ourselves whether growth in the Czech economy really will bounce back to an average of around 2.8% a year between 2015 and 2018? What is there in the works which really could make such a growth spurt – from the current near zero level – possible? Or could the IMF forecast numbers not be just another example of what Christine Lagarde once called “wishful thinking” of the kind that has been habitually practiced in, say, the Greek case. But let’s put the question another way. What might impede the country from reverting to a pattern of strong growth rather than simply continuing to bounce along the flatline? Well, you’ve got it – it’s the demography stupid! The Czech Republics population and workforce just turned the historic corner pointing towards long term decline. 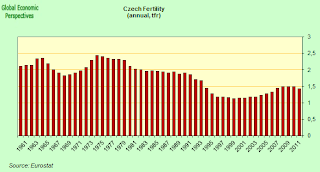 To some this piece of information may seem surprising, but CEE demographics in general really are quite unique, since while fertility fell and life expectancy started to rise as it did in the West, due to the development delay produced by nearly half a century of communist government most of these countries are now in the process of getting old before they get rich, creating a very special set of economic growth and sustainability issues. “In the first three months of 2013…. net international migration was equal to minus 4 people – the number of emigrants was 9 998 people and number of immigrants was 9 994 people. The highest net migration was reached with the citizens of Slovakia (1 213 people) and Germany (334 people), followed by United States (290 people) and Romania (213 people). The considerable decrease was registered in the number of citizens of Ukraine (by 2 201 persons), Czech Republic (by 505 persons) and the number of Vietnamese citizens (by 427 persons)”. 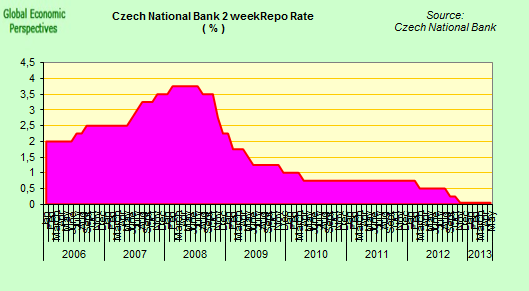 One of the lesser known details about the Czech economy is that – since it has retained its own currency, the Koruna – it has its own independent monetary policy and the central bank therehave now been holding interest rates about as near zero to zero as you can get (0.05%) for the past 8 months. This puts the country’s bank in more or less the same situation as most of its better known peers across the globe – namely it is now up against the “zero bound” which makes it difficult to lower nominal interest rates any further. With inflation weakening the debate at the central bank is now moving towards whether it will be necessary to use exceptional measures of the kind which would elsewhere be called QE. One option which is under consideration is a local version of “Abenomics” whereby the bank actively intervenes in the currency markets to provoke Koruna weakening – not so much to generate more export competitivness (banned by the G20) but rather in order to to try and raise the price level and avoid deflation risk (see these comments from central bank board member Lubomir Lizal). Such interventions, which (as in the Japan case) target the price level and not the currency value are for the time being accepted by the international community. The risk of outright deflation is thus intrinsically linked by the Fund to the downside risks to headline GDP growth. If the economy under-performs, and investment does not bounce back then not only will there be damage to the country’s long term growth potential, movements in prices might turn negative. Except, except….. what about the decline in working age population (WAP)? Isn’t that the factor that many feel is behind the ongoing battle that Japan is fighting with deflation? (See, for example, this post). 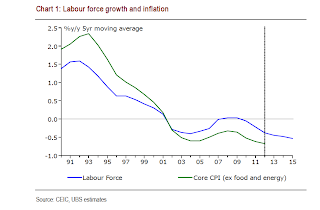 The Bank of Japan has long recognised that there is some sort of correlation between the rate of workforce growth and the rate of inflation (see chart below), with price inflation turning negative at more or less the same time as labour force growth did. The causality behind the correlation would be connected with the rate of rise (or decline) in domestic demand (initially consumption and then investment). Movements in WAP could be considered to be a good proxy for movements in employment and incomes, and hence consumer demand. As a country’s WAP enters decline then domestic demand tends to weaken and following this the investment which goes with such demand does not occur. 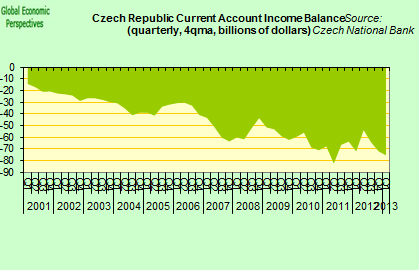 This is why failure to adequately resolve the present malaise into which the Czech Republic has fallen could produce a long term negative consequence for trend growth, as the IMF have highlighted. 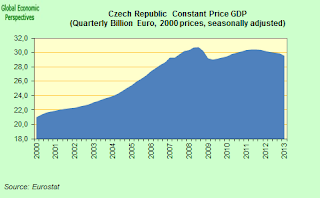 Thus it isn’t just a coincidence that the Czech Republic is starting to notice a fall in domestic demand and a fall in investment at just the time when the working age population starts to decline. This is a development which needs to be closely watched. But, beyond any loose similarities, there is one important sense in which the country differs from Japan – the state of its Net External Investment Position. The Czech Republic has, as I have repeatedly stressed, a strong export sector. 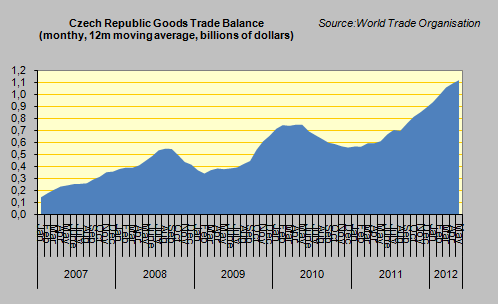 So much so that the goods trade balance tends to be positive and large. 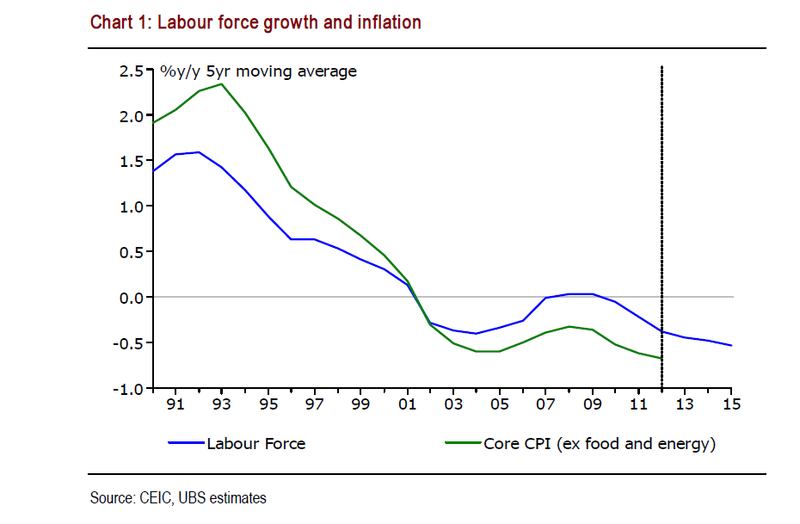 What’s more, it has been growing rapidly since the crisis. In fact, in Japan as the population has aged this balance has weakened. 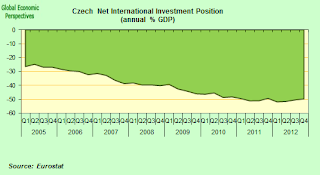 The income item is large and negative due to the country’s strong negative Net International Investment Position. 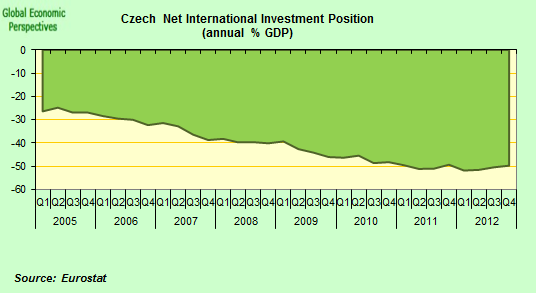 Simply put non Czech nationals have more investments in the Czech Republic than Czech citizens have abroad to the tune of some 50% of GDP. In an ageing society, with a shrinking workforce this situation is simply not sustainable. Czech companies and citizens need to save more, even though this will weaken domestic demand further and make the country even more dependent on exports, and more of these savings then need to be invested abroad to generate an income flow which will help the country support its rapidly ageing population from 2020 onwards. This situation is widespread across Eastern Europe (see Hungary here and Bulgaria here). One of the reasons for the low sovereign debt level is the fact the country privatized a number of its state owned companies at the start of the century – and herein lies the problem on the income side of the current account. Privatising to overseas (rather than domestic) investors means the even though the sovereign itself is less indebted, the level of indebtedness of the country as a whole doesn’t change much. Ultimately the sovereign supports the nation, and the nation the sovereign, so apart from the political debate about larger or smaller government the rest is more akin to moving the deckchairs around. This kind of privatisation does not guarantee long run sustainability for the country, and if not backed by a rise in domestic saving it can become “bread for today and hunger for tomorrow” as the Spanish expression goes. I’d have liked to see NGDP over the past few years. I’d assume weak to no growth there as well. You raise interesting points, indeed the Czech economy is likely to become a test bed for this whole situation. I have become convinced that as working age populations fall we will see very little, if any, economic growth. The downward trend is already obvious in the oldest countries (Japan, Germany, Italy etc), and it would not surprise me to see GDP growth turning slightly negative in a decade or so across much of the developed world. Just a thought-deflation causes the demographic problem as much as the demographic decline causes the deflation bias in the economy. 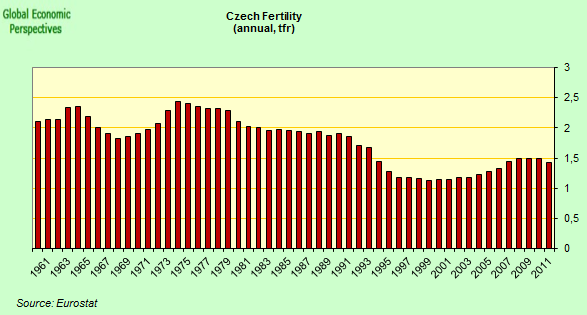 You can see this in 1930s US, in which (before widely available and effective birth control), you had a demographic slump.